BFL Owen & Associates (BFL Owen) was contracted by KTGY Architects to provide full structural engineering for the Sunroad Centrum Apartments – Phases 4 & 5 project located at Spectrum Center Boulevard in the City of San Diego, California. The project site consists of an approximately 5-acre rectangular parcel. 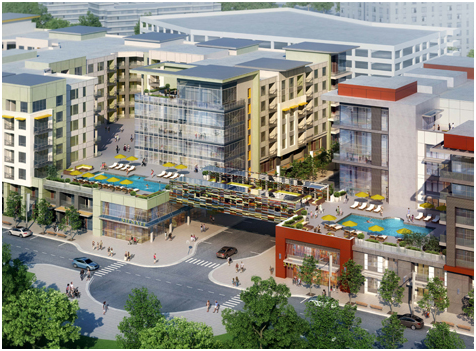 The Sunroad Centrum, is a mixed-use project which includes subterranean parking, retail spaces, townhouses, apartments, leasing offices, and related amenities. The project includes a total of 506,210 square feet of gross area for residential and 483,675 square feet of townhomes. Building No. 4 includes 309 residential units and 56 townhomes. Building No. 5 consists of 241 units and 45 townhomes (total of 550 units and 101 townhomes altogether. The projects include total of 1,079 parking stalls. The parking includes two levels above the grade and one subterranean. A bridge deck connects the two buildings together. Total estimated construction cost is 80 million dollars. Each residential building consists of five-story Type-IIIB wood structure supported by two-story type-I reinforced concrete sub-structure. The plaza includes pool, spa, sundecks, landscaping, trellis, etc. The residential buildings are constructed of light frame structures and podium and garages are post-tensioned flat slab, supported by reinforced concrete walls and pads.